Everything you do is determined by a belief or beliefs, certain principles. How you make sense of the world if governed by your beliefs. These beliefs become the foundation of your worldview (the platform from which you stand to make sense of the world). Every society is governed by principles which are the foundations upon which nations are built. The most important part of a building is the foundation, if the foundation is not strong, it doesn’t matter how beautiful the building is. Something like an idea, a principle or a fact that provides support for something. Both definitions agree with the idea that a foundation supports. When you go through the Bible you find a lot of titles for Jesus, the Lamb of God, Savior, Messiah, Word of God and so forth. Jesus is also known as the Living Stone. Jesus is known as the foundation stone. As you come to Him (Jesus) The Living Stone. Peter said that Jesus as a Living stone has been rejected by men, but chosen by God. It was God’s idea that Jesus became the foundation stone for people. When someone comes to Christ, he/she becomes a living stone that God uses to build his house (temple). It is our connection with Christ that makes us living stone, part of God’s building project. God’s house is called a holy priesthood, in other words, this spiritual house is to offer sacrifices to him. This house is for the worship of God. Peter addressed the religious leaders of his days and said: Acts 4:11-12 Jesus is the stone you builders rejected, which has become the capstone. Salvation is found in no one else for there is no other name under heaven given to men by which we must be saved. But to those who don’t believe, Jesus becomes a stumbling stone. Jesus can be both, he is either a stone for a firm foundation or a stone that you trip over. Paul describes Jesus as a Stumbling stone, Rom.9:32-33 They stumbled over the Stumbling Stone. Jesus is either a foundation or he’d be your ruin. HE is either the cornerstone for your life or he will be the stone that will make you trip and fall. Those who don’t believe in Jesus will stumble over him and fall to their ruin. This is what God has already determined. The difference is going to be what you choose to do with Jesus. He will either be your firm foundation or you will trip over him and end in destruction. 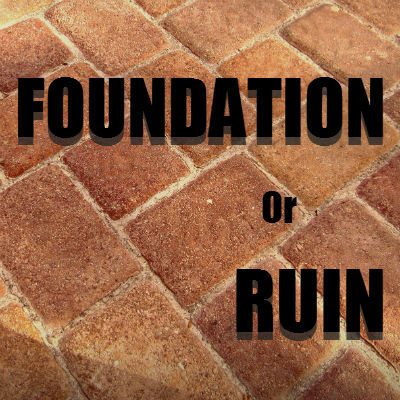 Jesus is either your foundation or your ruin. You will have to do something with Jesus because you destiny is based on what you choose to do with him. My prayer is that he is to you the firm foundation.